A season of film and video as part of the ELEKTRONIC festival at the Barbican. 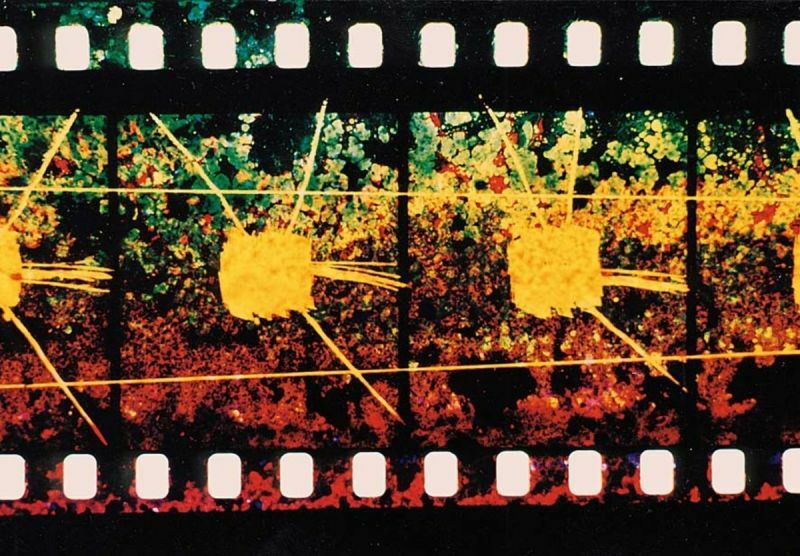 It might seem logical to suppose a historical and natural link between electronic music and abstract or impressionistic films, but there are surprisingly few examples of films that were made in direct collaboration between filmmakers and composers or musicians. However, there is a significant body of films that ‘borrow’ or re-appropriate recordings of contemporary music, and a number of works for which their makers have assembled soundtracks which may, if separated from the visuals, be heard as extraordinary electronic compositions. In such films, electronic, tape music, noise, primitive sampling and musique concrete come together in chaos or harmony to accompany astounding visual constructions. 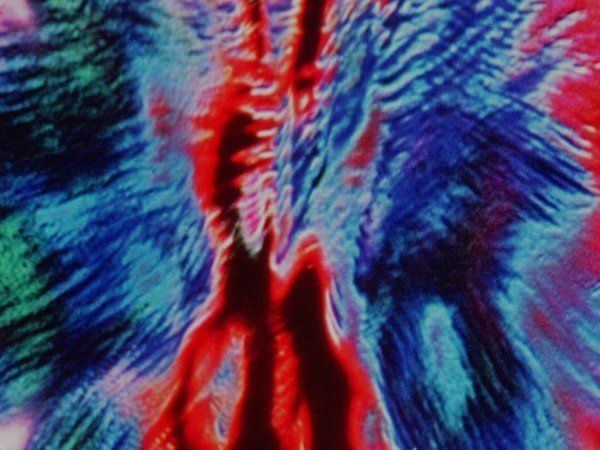 The film series of the Elektronic festival will present screenings in which the sound and image complement each other on the highest level. 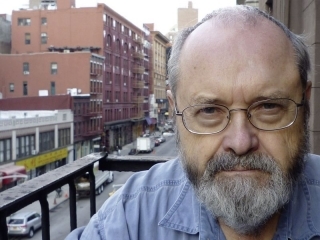 It will feature an international selection of historic and contemporary works by Bruce Conner, Malcolm Le Grice, Peter Tscherkassky and others, and a live music and film concert by Phill Niblock. Composers whose unique works may be heard of the soundtracks include Edgar Varese, Christian Fennesz, Terry Riley and Karlheinz Stockhausen. The series will open with an informal screening in the Barbican Pit Theatre on the afternoon of Saturday 13th October. Between the films, Mark Webber and Gregory Kurcewicz will be playing recordings of rare and wonderful electronic music. Come down to our level and see what you’re in for. Sounds emanating from the early electro-acoustic studios and the primitive/pioneering synthesisers of Robert Moog and Don Buchla. An informal film screening punctuated by recordings of scarce and wonderful electronic music through the ages played by Mark Webber and Gregory Kurcewicz. Including Mick Jagger’s mind-bending score for Kenneth Anger’s Invocation of My Demon Brother and rare recordings of Varese and Ussachevsky. Come hang out, watch films, listen to music, drink coffee, pretend to stroke your beard (though that’s an entirely inappropriate thing to do). 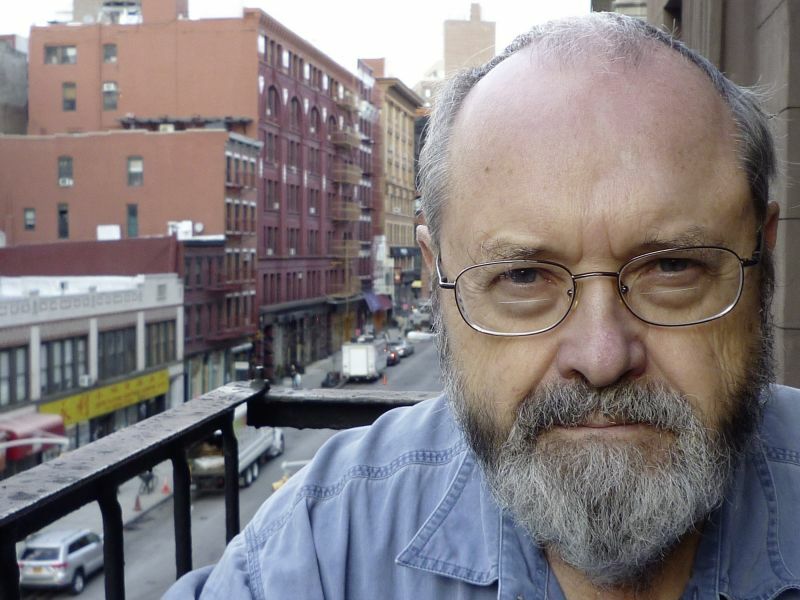 Intermedia artist Phill Niblock (USA) presents a concert of live and pre-recorded microtonal music with simultaneous triple video projection of sections from his long running Movement of People Working film series, shot in Mexico, Peru, Brasil, and China. Niblock makes thick, loud drones of music, filled with microtones of instrumental timbres that generate a multitude of difference tones in the performance space. Guitar Too, For Four will be augmented by a live electric guitar quartet featuring Jem Finer, Robert P. Lee, Matt Rogalsky and Mark Webber. Going beyond direct experience into the spiritual and ecstatic realms, reaching outwards / inwards / upwards toward perception. Beginning with a film that “plays directly on the mind through programatic stimulation of the central nervous system” and ending with Bruce Conner’s amazing hallucinogenic journey. Rarely seen works by the abstract masters Davis and Belson, plus Kirchhofer’s stunning dematerialization of celluloid and Vegter’s captivating computer piece. Plays directly on the mind through programatic simulation of the central nervous system. 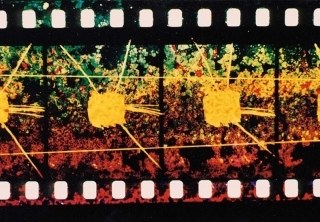 Individual frames of film are imprinted on the retina of the eye in a rhythm, sequence and intensity that corresponds to Apha-Wave frequencies of the brain. Becomes an experience of meditative liberation beyond the threshold of visual comprehension. Visions turn inward. The film directs our mental processes, controlling how we think as well as what we see. Images fuse with their after-images, colours arise from retinal release of exhausted nerve endings, forms dance across short-circuited synapses of the mind. 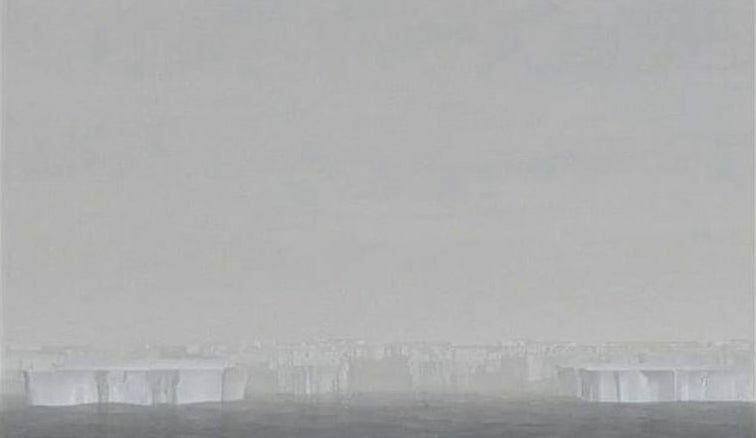 Made entirely from a scrap of found footage taken from an old animated cartoon representing a sheet of falling rain. The cartoon was called The History of Cinema. Just as the musician organises rhythms of sound in order to stimulate imagination and produce an emotional response, so I organise visual rhythms of moving forms of colour. Also like the musician, who doesn’t use the sounds of nature but invented sounds, produced by various instruments, I use invented forms of colour which I produce artificially with brightly coloured transparent plastics. I set them in motion, play light upon them, and film what happens. Obviously, I am not trying to present facts or to tell a story. I am trying to stir the creative imagination of my fellow men. A computer-film in three parts. The images consist of 8 to 14 independent elements. Each part has its own, formal starting-point. On this formal basis, variations are executed by gradual changes in position, direction, movement, velocity and colour of the elements. After making four animated abstract films ‘by hand’, this is my first film made with a computer. The formal approach that I use generally in making films proved to be very suitable for the way a computer works and can be programmed. This brought me to writing image- generating programs in computer-language, of which Nacht-Licht is the first result as film. The way I make films can be compared to building a “machine” which produces images. This machine consists of the working-principle: the system I choose to generate the images. In this manner series of images are generated, determined by (1) the machine, and (2) the data I put into it. I think of Allures as a combination of molecular structures and astronomical events mixed with subconscious and subjective phenomena – all happening simultaneously. The beginning is almost purely sensual, the end perhaps totally nonmaterial. It seems to move from matter to spirit in some way. 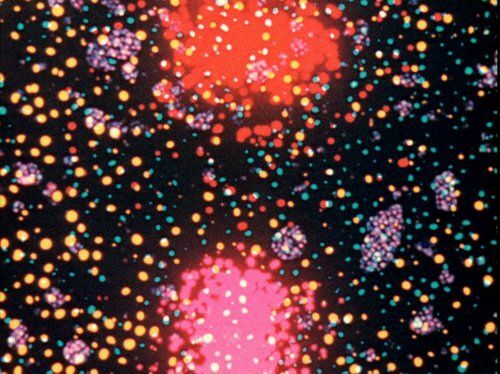 Oskar Fischinger had been experimenting with spatial dimensions, but Allures seemed to be outer space rather than earth space. After working with some very sophisticated equipment in the Vortex Concerts, I learned the effectiveness of something as simple as fading in and out very slowly. Confusion … delusion … retribution. Electronic feel flows as your nervous system careens into overdrive. From the chaotic Outer Space to the sublime #11, five films plugged directly into the National Grid to give maximum audio-visual pleasure (or pain). Throbbing, shouting, screaming, smashing … This is not for the faint-hearted, but what doesn’t kill you makes you stronger. In Spring 1972 a series of analyses of colour emulsion ‘grain’ imagery was undertaken (the word ‘imagery: is significant because only representations of light sensitive crystals, or ‘grain’, remain on a developed roll of colour film). The investigation is preliminary to the shooting of Section 1 of “Re: Re: Projection”, Variable Emulsion Density, wherein attempts to construct convincing lap dissolves of solid colour fields with straight fine grain Ektachrome ECO proved unsatisfactory. It was thought that more ‘grainy’ colour field interactions might adequately prevent the undesirable smoothness of hue mixture resulting from ECO superimposition. A discreteness of individual hues, during superimposition, is necessary; then, a switch to Ektachrome EF, pushed extra stops in development, seemed somewhat reasonable. Still, unexpected (colour blurring) problems arose and it was clear that a ‘blow up’ of the situation was called for; a set of primary principles was needed and, particle by particle, Axiomatic Granularity seemed to formulate itself. Its ‘structure’ lacks normative ‘expressive intentionality’. 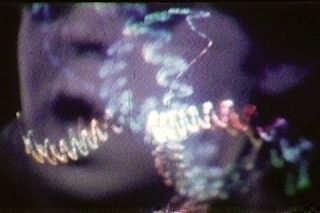 A film in which all images were generated by intermittently recording the movement of a line. It is a film about the discontinuity that lies at the heart of the film medium. After making films #3 and #5 I was thinking about other methods to generate images by distributing light across film frames in perverted ways. One idea that came to mind was to record a continuous movement with long exposures like I had been doing before, but to interrupt these exposures many times to generate visual patterns. This would create interesting interferences between the motions involved. The other development was my increasing interest in the technological history of film. 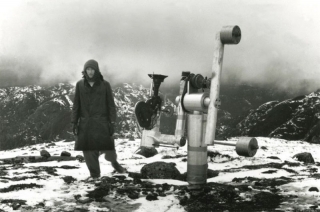 I had been looking for a kind of ‘pure’ film: images the film apparatus would come up with if left alone, as it were. While thinking about ‘pure’ film I started to look towards the historic origins of film and new media in general. Besides “#11” this led to experiments I did with various mechanical installations using nipkow discs or anorthoscopes. In order to make the film I constructed a machine with the help of which I was able control three movements: the movement of the film in the camera , the rotation of a shutter in front of the lightsource, and the movement of a line in front of the camera. The interferences possible between these three motions are the material I used to compose #11. For every section of the film I recorded a set of high contrast black and white originals which I used in the optical printer to create interference images in colour. The sounds of the analogue versus the digital, burning a cathode ray hole direct through your retina. A video programme of recent audio-visions from Vienna and other painfully modern assemblages from UK, France and Canada. Having broken sound and image down to its constituent blips and pixels, these contemporary filmmakers are reconstructing matter in beguiling new ways. Animated abstracted synthetic sound-to-image/image-to-sound digital material parsing experiments collide with trad pagan Beltane folk dance remixed Seven Step Polka in fragmentary, fractured fast digital scratch mix. Composed of synthetic light and voice samples, Azur attempts to establish an emotional link with the spectator. Inspired by the filmmaker’s interest in early Romantic landscape painting, especially the works of Caspar David Friedrich. Though “Temko” by General Magic is virtually the sole element of the soundtrack, this work was not intended to be a music video. The abstract spatiality of the music, which was apparently set in contrast to the images, and their cycles complement one another to produce the same intangibility. I believe that each image is creative of music and that each sound is a creator of images, and the two entities are independent of each other. Chrominances is built like a conversation between visual and musical reasoning. A new dialogue is born, a dialogue which neither visual, nor aural. It is a dialogue which binds the audio-visual spectator with the object, a dialogue which is not imposed, an original dialogue on each vision, each hearing. I tried to make a creative film of freedom, where the eyes and the ears would be two dancers who always dance together for the first time. During a transmission, a video recording was damaged by defective equipment to the extent that none of the original concrete elements were visible. The fragments remaining from the process of decomposition were fed into a defective computer system, and a camera was able to capture only a portion of the stream of information. The result: the originally concrete footage was reorganised in a different aesthetic context through these limitations. A lively game with spatial structures. The constant modulation of scales and the resulting shifts in the grid’s spaces provide glimpses into ‘microscopic’ spaces. 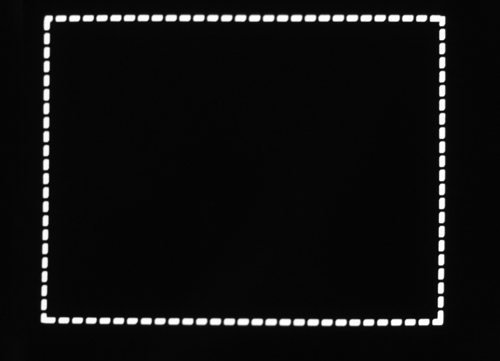 Optical sound on 16mm film – a lightbulb reads a strip of amorphous black emulsion on clear celluloid and it somehow makes sound sense. Since the 1930s artists have examined and exploited the possibilities of drawing or printing a soundtrack. Two senses combined and confounded, both musical and cacophonous. 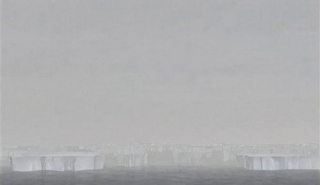 Can you see what you hear? Screening introduced by filmmaker Guy Sherwin. John Cage wrote, in 1938, of a “new electronic music” to be developed out of the photoelectric cell optical-sound process used in films. Any image – his example is a picture of Beethoven – or mark on the soundtrack, successively repeated, will produce a distinct pitch and timbre. This new music, he said, would be built along the lines of film, with the basic unit if rhythm logically being the frame. However, with the subsequent development of magnetic tape a few years later (and the advantages it has in convenience, speed, capacity to record, erase and playback live sound), the filmic development of electronic music initially envisioned by Cage was obscured. Had magnetic record tape never been invented, undoubtedly a rich new music would have developed via optical sound means, and composers would have found ways to work with film. In Linear Dreams, Richard Reeves explores new realms of the imagination. The piece begins with a line pulsing to a heartbeat -the base for all living things. Images then explode and implode until they are released from the human form, expand outward over a vast mountain range, and then return to their origin. Reeves’ hand-drawn soundtrack underscores Linear Dreams, creating a multiple award-winning piece filled with rhythmic electricity. This film was directly executed on computer without cinematographic intervention or equipment. It is not the communication of a movement, but a succession of facts made up that the device of projection translated for us into impressions of movements. This film does not refer to an external reality, but wants to be its own reality. A one second shot of me walking into the shot wearing a striped jersey was printed repeatedly. 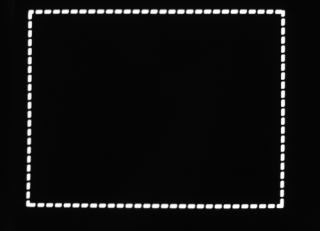 This strip of negative was moved laterally across the printer every ten seconds of film time, so that the image of the piece of film material, containing its figurative image moves into the projected frame from the left, across the frame and out across the optical soundtrack area to the right. Featuring a new line in Musical Pullovers. In this film, the image produces the sound, and the sound is the image. It catches sight of landscapes and incidents. The various images are used to cover an extensive range of sounds. The principal melody is a radiograph of a comb. I shot the images of a staircase specifically for the range of sounds they would produce. I used a fixed lens to film from a fixed position at the bottom of the stairs. Tilting the camera up increases the number of steps that are included in the frame. The more steps that are included in the frame the higher the pitch of sound. A simple procedure gave rise to a musical scale (in eleven steps) which is based on the laws of visual perspective. A range of volume is introduced by varying the exposure. The darker the image the louder the sound (it can be the other way round but Musical Stairs uses a soundtrack made from the negative of the picture). The fact that the staircase is neither a synthetic image, nor a particularly clean one (there happened to be leaves on the stairs when I shot the film) means that the sound is not pure, but dense with strange harmonies. Before the sampler: the tape machine. Before the break-beat: the tape loop. Before plunderphonics: musique concrete. Going back to a time when it was inventive and original to play with and re-appropriate snatches of sound gathered from disparate sources. Pre post-modernism from pre-eminent filmmakers. Composed from an obsessive collection of Vietnam atrocity images I collected from foreign magazines and newspapers over a five-year period. 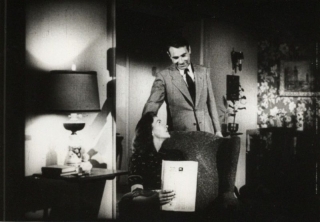 Magnifying glasses from the ‘five and dime’ were taped onto a borrowed 16mm Bolex in order to physically ‘travel’ within the photographs – producing a rough animation. Images in and out of focus, broken rhythms and pans, the abstracted shapes and motions, speeding perceptual contradictions. For instance, a pointillism of falling black specks in focus becomes bombs dropping through the sky; and impressionistic swirl of tones translates as faces of US soldiers leading barefoot villagers from a gas-filled tunnel; a “Rembrandt ink drawing” focuses in as a tank dragging a roped body… James Tenney’s sound collage intercuts three-second fragments of Vietnamese religious chants and secular songs with fragments of Bach and 1960s ‘Top of the Charts’. A setting-to-film of a ‘collage’ of Stephen Foster phrases by composer Joel Haertling. The recurring musical themes and melancholia of Foster refer to ‘loss of love’ in the popular ‘torch song’ mode; but the film envisions a re-awakening of such senses-of-love as children know, and it posits (along a line of words scratched over picture) the psychology of waiting. Snow’s mammoth endeavour. Three hours of continuous swooping, swirling, twisting pans over a desolate Canadian landscape. The remote tonal instructions to the camera provoked an inspired minimal (maximal) soundtrack. Hold on to your hats, this trip may take some time. Special off-site screening related to the “Cinema Auricular” programme at the Barbican Cinema.